One of the things I like to do after a race is to reflect on how I did and what I can learn. I find it helps to look at the results and see where I lost/made time on those around me. So I took the official results from the Devil o’ the Highlands Web Site and sorted them out into legs and overall positions…. From the table I can see that I held my own for the first two legs as I was 13th fastest to Glencoe and then 13th fastest again to Kinlochleven. 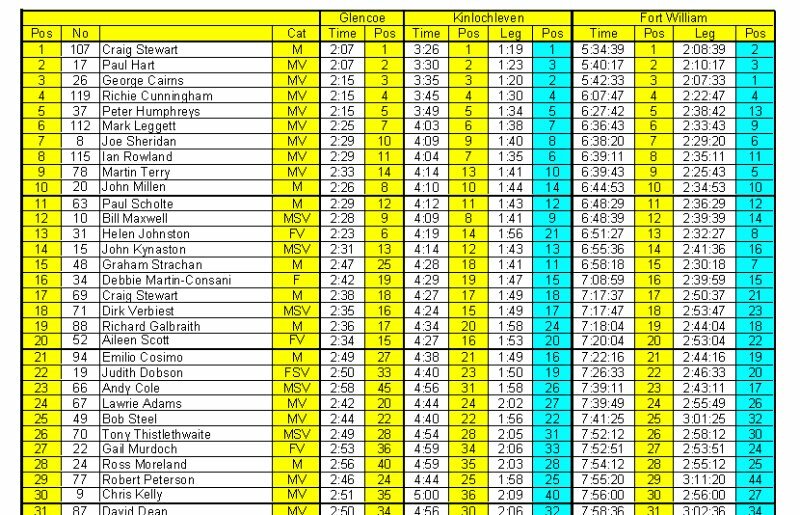 But I was 16th to Fort William. I knew I’d struggled on the first 45mins out of Kinlochleven and the numbers confirm it. I was with Martin Terry coming out of Kinlochleven and he finished 16mins ahead of me. Helen Johnston who caught me on the Lairig Mor was 11mins faster. Even Debs was almost 2mins faster than me!!!! Only kidding Debs – just goes to show what a great run you had. If you are finishing that strong I’ll need to watch out in next year’s whw!!! I’ve not got numbers from Lundavra but I suspect that my 1hr 10mins from there would be similar to others around me but it was the section to Lundavra where I lost ground. In each of my ultra’s this year I have to a lesser (whw, devils) or greater (Fling) degree run out of energy. On Saturday’s race I relied on gels for my intake. I did eat one museli bar and 1 nutri grain bar and some jelly babies and sweets but looking back it probably wasn’t enough. I seem to be starting well, eating small amounts regularly but then I either forget or think I can get away with it. I have a repeat 90mins on my watch for taking my succeed tablet. Maybe I should follow George Reid’s tactic and have it on 30mins to remind me to eat! Or it could just be that I have to accept that in every long ultra run there will be a time when things are tough and you have to get through it as best you can. I know that I have taken my planning to another level this year and maybe it is a bit ‘overboard’ but it has given me the confidence to run at my pace and know that I can achieve my goals. It helps me to concentrate on the next few miles rather than the whole distance. On Saturday I didn’t look at the overall distance on my garmin once. I had my watch on the present leg and that was all that mattered. As Brian commented it does seems to work for me and I will continue to refine it. I think where it is a negative is when I fall behind like I did on Saturday on one of my mini-sections. Then I have to be willing to forget that section and concentrate on the next one. I realise my approach is not for everyone (or even anyone!!) but I find it helps me and that’s the key thing. Once again Katrina was superb. I’d given Katrina a sheet (laminated of course!) with what I might want at each stop and she had it ready for me to take and go. One of the things I wanted to try on this ‘shorter’ ultra was not to stop at all but to grab stuff and keep moving. I felt that worked really well and it is something that I’m going to experiment with for next year’s whw. I’m not sure I want to do that for my next ultra – the Hardmoors 110 as I think I’ll need to have decent stops in that one. I think I have this down to what works now. My shoes (Inov-8 Roclites) are comfy and my tactic of putting sudocrem all over my toes and wearing 2 pairs of socks (one thin and one thicker) mean I’ve not had any blisters this year at all. My two bum bags – one on the front with food and one on the back for my water bottle and succeed tablets is easy to run with. I love using my garmin and it has helped me mentally knowing exactly how far I have to go and what pace I’m running at. So overall I was very happy with my race and really pleased with my time. I wanted to use this as a build up to the Hardmoors in the same way that the Fling is a building block for the whw race. I now have just under 7 weeks before the Hardmoors. In 3 weeks time (Sunday 30 August) I have a 60 mile training run planned (Bridge of Orchy to Milngavie) when my main aim will be to run very slow and very steadily imagining I’m running the first half of the Hardmoors race. PS … my video of the race is almost ready! This entry was posted in Devil O' The Highlands Race Results, Lessons learnt. Bookmark the permalink. That's your best spreadsheet EVER! Be honest, I bet you nearly choked when you saw I was faster in the last section!! I know I did. Thanks for doing the spreadsheet John, it's really helpful. Re food I'm becoming convinced that shorter races (say 10-12 hours or less) are different from longer ones because (a) you're going faster so you can't digest “proper” food so well, and (b) you don't need so much “per mile” because your reserves can play a bigger part. I also went only with gels on Saturday, one every 30mins which meant I got about 1500 cals total, but it seemed OK – was definitely ready for the pasta at the finish though!